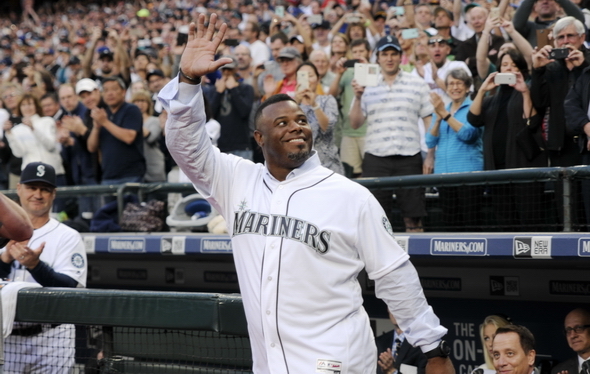 Ken Griffey Jr.’s record 99.32 percent of the Hall of Fame vote testifies to his greatness. Here’s what he might have done if he stayed healthy in his prime. When Ken Griffey Jr. won election to the Baseball Hall of Fame in January with 99.32 percent of the vote (named on 437 of 440 ballots), two topics dominated the ensuing discussion: The identity of the three schmos who bewilderingly failed to vote for Griffey, and the question of what his career would have looked like had he not lost so many games to injury. The Baseball Writers Association of America refused to “out” the writers who whiffed, so it’s unlikely they will receive a well-deserved Twitter flogging. As to the look of Griffey’s career had his body held up, behold the math. By the end of the 2000 season, the 31-year-old Griffey had spent 10 years with the Mariners, one with the Cincinnati Reds. At mid-prime, he had 438 home runs, won 10 Gold Gloves, seven Silver Sluggers and an MVP award (1997, unanimous), while finishing in the top five in MVP voting four other times. Griffey also led the American League in home runs four times and made the All-Star team 11 consecutive years, winning a record eight elections as a starting center fielder. When Griffey was named to the MLB’s All-Century Team in 1999, he aced the eye test as a future first-ballot Hall of Famer. By the end of Griffey’s age-31 season (2000) he played in 1,680 games, missing only one significant stretch, 73 contests, from May 26 to Aug. 15 in 1995, due to a hand broken while making his famous Spiderman catch against the right-center wall in the Kingdome. As Griffey entered his second season with the Reds in 2002, Baseball Prospectus predicted that he was a lock to become the third man, following Hank Aaron and Babe Ruth, to hit 700 home runs, and that he would likely snare two or three more MVP awards. Sounded reasonable, if not a given. Then things went awry. Griffey suffered a torn labrum, a dislocated patella, a torn hamstring and a second broken hand. Instead of averaging 150 games as he did during his first 11 seasons, Griffey averaged 92 games and 324 at-bats over the next six, practically wrecking the remaining of his prime years (ages 31-36). Looked at another way, after turning 31 Griffey made the All-Star team only twice in his final 10 seasons. He never won another Gold Glove or a Silver Slugger, never led a league in any notable hitting category, and made only one appearance on an MVP ballot, a 24th-place finish in 2005. During the five seasons prior to his injuries, Griffey averaged 49.8 home runs per season. Over the next six, when he lost 346 games to injury, he averaged 19. That probably cost him between 100-115 home runs. At the time of Griffey’s retirement in 2010, ESPN’s Jason Stark devised a formula that calculated that a fully healthy Griffey likely would have hit 147 more home runs, placing his career total at 777. David Vincent, who compiled The Home Run Encyclopedia, wasn’t as generous as Stark, placing Griffey’s lost home runs between 100-125. One more bit of math: Griffey averaged one home run every 17.9 plate appearances during his 22-year career. Since he missed an estimated 2,570 plate appearances, that’s a loss of roughly 143 home runs. Even if you subscribe to Vincent’s low-end total of 100 missed long balls, adding that to Griffey’s final total of 630 places him at 730. Barry Bonds needed exotic pharmaceuticals to post the all-time record of 762. All of that doesn’t take into account how many more All-Star games, MVP awards, Gold Gloves and Silver Sluggers Griffey might have added had he been fully mobile during his 31-36 age years. Even with the injuries, the career Griffey delivered was epic. With good wheels, he almost certainly would have joined Aaron as the only players with 700 home runs and 3,000 hits. Griffey probably would also have joined Willie Mays as the only ones with 600 homers and 12 Gold Gloves. More likely, he would have become the only player with 700 home runs and a dozen GGs. Given that he earned 99.32 percent of the Hall of Fame vote, an all-time record, it’s not surprising that Griffey shows up on practically every list of the all-time greatest outfielders. There is no way to statistically compare Griffey’s career to that of, say, Ty Cobb, who played in the dead ball era, and was an entirely different kind of player. The following are outfielders who received at least 88 percent of the Hall of Fame vote, minus Griffey (99.32), listed according to highest percentage. Ty Cobb (1905-28, 98.23%): Recorded 3,000th hit at age 34 years, 122 days, youngest in history to reach the milestone. Hit .366 and won 13 batting championships, including the 1909 Triple Crown. Without a time machine, there is no way to know how good he was defensively. Hank Aaron (1954-76, 97.83%): No. 5 all-time in WAR among position players (142.6), Aaron is baseball’s all-time leader in total bases (6,856) and RBIs (2,297). Tony Gwynn (1982-01, 97.61%): Named to 15 National League All-Star teams, Gwynn won eight batting titles (.338 career average), five Gold Gloves and seven Silver Slugger awards during his 20 years with the Padres. He hit only 135 career home runs, but had five 200-hit seasons. Babe Ruth (1914-35, 95.13%): The all-time leader in OPS (1.164), No. 1 in slugging (.690) and No. 2 in on-base percentage (.474), Ruth is also the career leader in WAR (183.7) among all players as well as for position players (163.1). In addition to his 714 home runs, Ruth also hit for average (.342). Considered so-so defensively, athletic as a young player, below par as a big-bellied older player. Rickey Henderson (1979-03, 94.81%): Henderson hit only .279 in his 25-year career, but cracked 279 home runs as a leadoff hitter, collected 3,055 hits and stole a record 1,406 bases. A 10-time All-Star, Henderson won one MVP award (1990). Willie Mays (1951-73, 94.68%): Mays is the only player with 300+ home runs (660), 300+ steals (338) and 12 Gold Gloves. Among HOF outfielders who received at least 90 percent of the vote, Mays is the only one to have won a batting title (.345 in 1954) and home run crowns (1955, 1962, 1964-65). Carl Yastrzemski (1961-83, 94.63%): Yaz won three batting title, an MVP, and is was the last player to win the Triple Crown (1967) until Miguel Cabrera won in 2012. He had a .285 batting average over 23 seasons and ht 452 home runs. Reggie Jackson (1967-87, 93.62%): Twice a World Series MVP (1973, 1977), Jackson also won the 1973 MVP award, made 14 All-Star teams and slugged 563 career home runs. Ted Williams (1939-60, 93.38%): A 17-time All-Star, Williams won two MVPs, two Triple Crowns, was a 12-time leader in on-base percentage, and the last man to bat .400 (.406 in 1941). He also missed three years in his prime serving in World War II. Stan Musial (1941-63, 93.24%): Musial won seven batting titles, three MVP awards and finished with a .331 batting average and 475 home runs. He posted an OPS above 1.000 four times. Roberto Clemente (1955-72, 92.69%): Clemente won four batting titles with the Pirates and produced three 200-hit seasons, finishing with exactly 3,000. A 12-time Gold Glove winner, he died in a plane crash Dec. 31, 1972. Frank Robinson (1956-76, 89.16%): Robinson won MVP awards in both leagues (National, 1961, American, 1966) as well as in the All-Star game (1966, 1971) and World Series (1966). A .294 career hitter, he hit 586 home runs. Joe DiMaggio (1936-51, 88.84%): DiMaggio recorded 2,214 hits, but missed three seasons (1943-45) due to military service. He posted a career .325 batting average, a .977 OPS, and owns the all-time record 56-game hitting streak in 1941. Al Kaline (1953-74, 88.31%): Kaline never won an MVP, but played in 18 All-Star games, won a batting title (1955), earned 10 Gold Gloves and finished his 22-year career with 3,007 hits and 399 home runs. Mickey Mantle (1951-68, 88.22%): A three-time Most Valuable Player (1956-57, ’62), Mantle won the 1956 Triple Crown (.353 BA, 52 HRs, 130 RBIs) and finished with 536 career home runs. Forget the three guys who didn’t vote for Griffey. How about the 12 PER CENT who didn’t vote for Mantle or Dimaggio? Griffey was spectacular but Willie Mays was the greatest player to ever pick up a bat or pull on a pair of spikes. I will only accept a writer not voting for Junior if they voted for Edgar instead. Not many people realize that Babe Ruth won almost 100 games as a pitcher, which would probably entitle him to be called the greatest player of all time. Many do not realize that Williams went off to war in 1941 and didn’t return to baseball until 1946.